These benefits go beyond just a healthy mouth – they create a happiness and joy for those in need! Are you or someone you love in need of dentistry, but a trip to the dental office is out of reach? Many elderly patients don’t have transportation to reach the destinations that we can sometimes take for granted. Dr. Kauffman understands the struggles that come with living with limitations and has a passion for those in need for Geriatric Dentistry, pursuing dental home services for those in need. Dr. Kauffman is a house call dentist for those in the NYC area that are in desperate need of oral care. Aside from being one of the top 25 dentists in the nation, she also serves as the Director of Geriatric Dental Care for 3 local nursing homes, and on staff at both Mount Sanai Hospital and Lenox North Shore LIJ, Dr. Kauffman specializes in patients with Alzheimer’s Disease, Parkinson’s Disease, and all forms of Dementia. According to the American Dental Association, a fifth of people age 75 or older have not seen the dentist in over 5 years. Reasons can include the lack of access to a dental office, lack of transportation or disabilities such as Dementia, Alzheimer’s and other diseases. In 2015, 64% of those 65 and older needed long term, assisted care. These statistics cry out for the need of accessible dental, which is found with using the services of a house call dentist. Without the proper tools, you can’t create with quality. The same goes for your teeth. Without healthy teeth and proper oral care, you can’t expect a healthy body. Teeth are needed to chew your food and feed your appetite, providing your body with the nutrition it needs. Routine cleanings and proper oral health are linked to many conditions in the body including heart disease and diabetes. Reduce your risk of infections by keeping your mouth clean. 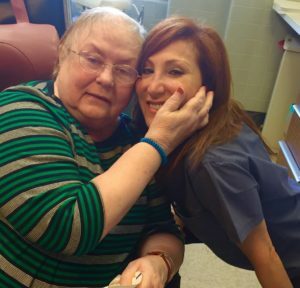 Dr. Kauffman and her passion for the elderly is evident in her everyday life. Take a look at this clip that was featured in Souls of NY to discover what it looks like to receive a house call from Dr. Kauffman. For more information on house call dentists, contact Dr. Kauffman today at 917-826-6278. By 2050 the rate of edentulism is projected to slow to a mere 2.6% of the population being edentulous, or without teeth, according to the International & American Associations for Dental Research. This presents a significant impact on home dental care for seniors. It directly necessitates more prevalent preventive dental care for elderly. But why a need for home dental care for seniors? Some elderly have difficulty traveling. Many elderly are confined to a wheelchair, presenting greater difficulties in traveling. However, the difficulty of wheelchair transportation is not the only challenge facing the aging population. Some individuals must have oxygen, monitors or IV’s on them at all times. This also makes travel to and from a dental office challenging. Take into account those seniors that live in a large metropolis with limited parking, long walks, and crowded public transit systems and the travel becomes ten times harder. Some elderly cannot afford the extensive costs associated with their travel. Directly related to the previous point, those that need various medical equipment and constant medical attention may find that the cost of traveling to a dental office is actually much higher than the cost of receiving dental care at home. Some must pay for a nurse to be present at all times during the travel, as well as possible special transportation or equipment. Some elderly are not mentally prepared for the anxiety of a dental visit. As aging individuals’ experiences become limited to only necessary activities within the home, their emotional grid for handling various experiences becomes limited as well. Something that would have presented itself as a simple task 20 years ago, suddenly becomes anxiety ridden. Some elderly even have physiological conditions, such as dementia, that demand no delineation from routine or else severe anxiety and behavioral issues will occur. Finding home dental care for seniors from a geriatric house call dentist provides convenience, savings, and peace of mind. Dr. Alisa Kauffman of Geriatric House Call Dentistry has been providing quality dental care for her aging patients for over 30 years. Contact us for more information concerning our dental care senior citizens love and trust.